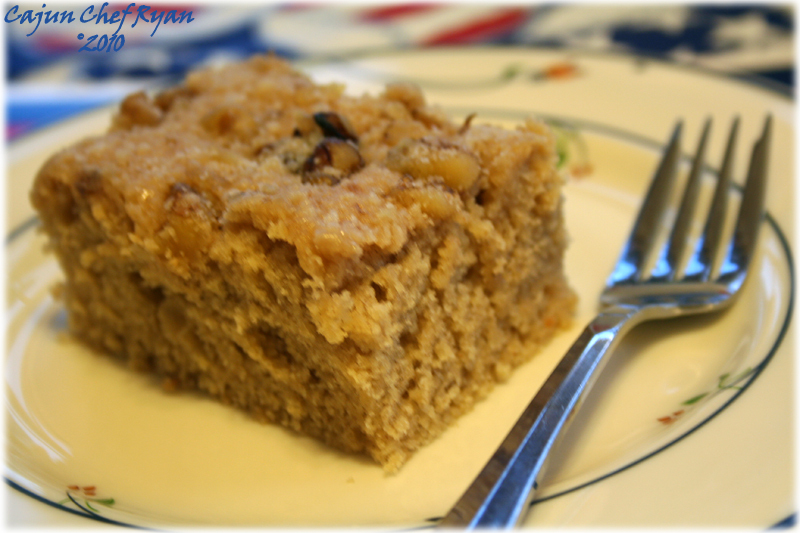 A serving of Buttermilk Coffee Cake. This recipe prepared in a 9×13 pan, makes about 18 servings, preparation time is about 30 minutes, and the bake time is 35 minutes. 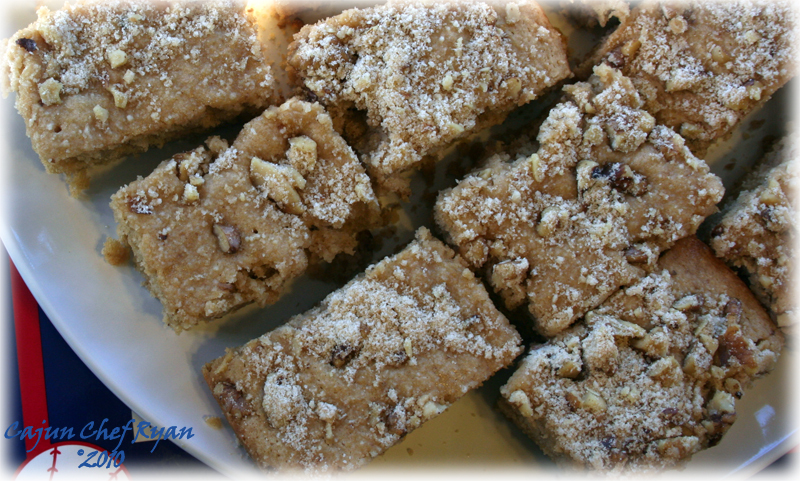 So, in just a little over an hour you can have some tasty breakfast buttermilk coffee cake on the table. Tip: use a food processor to cut the butter into the flour, sugar, and salt in step 2, and you can cut your preparation time to just 20 minutes. Tip: If you do not have any buttermilk on hand, you can make a substitute of 1 1/3 cups of sour milk by taking 4 teaspoons of lemon juice or white vinegar and adding it to a 2-cup measure, and then add enough milk to make up the 1 1/3 cup of total liquid. Stir well and allow it to stand for about 10 minutes. 1. Grease the bottom and sides of the 9×13-inch baking pan then set aside. Preheat the oven to 350° F if using a baking pan, or 325° F if using a baking dish. 2. In a large bowl, combine the flour, brown sugar, and salt. Using a pastry cutter, cut in the butter until mixture resembles coarse crumbs. You can use a food processor to cut in the butter also, which speeds up the process and cuts your preparation time by about 10 minutes. Set aside ½ cup of the crumble mixture. Then stir in the baking powder, baking soda, cinnamon, and nutmeg into the remaining crumble mixture. 3. In a medium bowl, combine the eggs and buttermilk. Add the egg mixture to the crumble mixture, stirring just until moistened. 4. Spoon batter evenly into prepared 9×13-inch baking dish. In a small bowl combine the reserved ½ cup of crumble mixture with the walnuts and sprinkle evenly over the batter. 5. Bake for 35 minutes or until a toothpick or cake tester inserted into the center comes out clean. 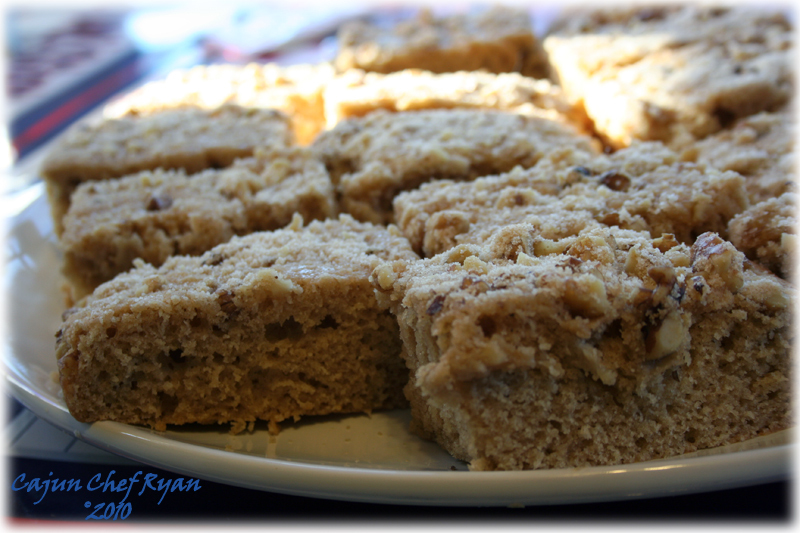 Allow the coffee cake to rest for 10 minutes before cutting, then serve warm with your favorite hot coffee or tea. Lovely! Yum! All I needed was the words “coffee cake” and I was here in flash to see what the chef cooked up–just screams “make me!” It goes on the faves tab right now! 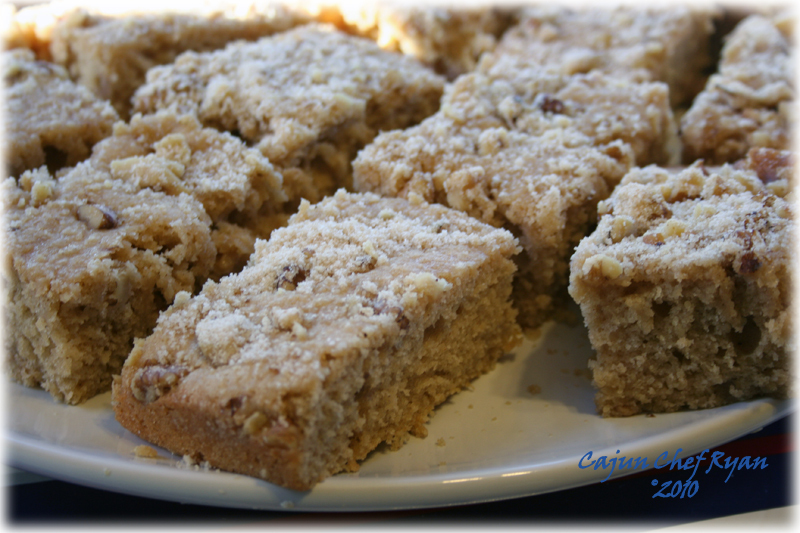 this is a beautiful coffee cake yum I can just smell that cinnamon aroma filling the house! I can feel the coffee aroma of this wonderful cake from the screen!! This is making me quite hungry at 11 p.m. and I shouldn’t be. I feel that coffee cake may be in my near future. Thanks for the recipe. Thanks for the awesome comment! it truly means a lot coming from a real chef! I’d love to learn how you make your chicken fried steak. always looking for the most perfect chicken fried steak! Claudia, it does have a wonderful aroma! Gera, how wonderful it would be if food would fly off the screen! Daniel, coffee cake is good 24/7, right! I love all things buttermilk – will definitely be trying this one. Yum and thanks for the post!! 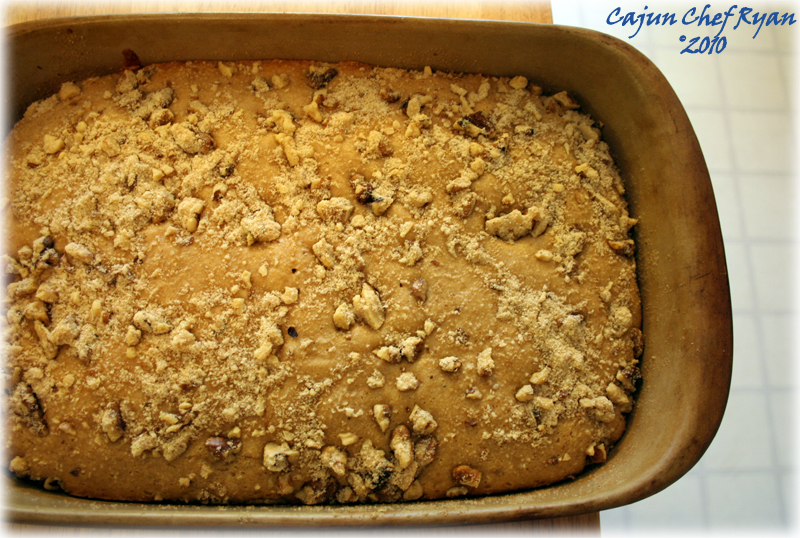 What a great looking coffee cake, it has the topping and nuts just the way I like it!! Just wish some of the pics were smaller so I could stumbleuponphotoblogit!! Looks great Ryan and of course I love it! I love all things muffin & coffee cake! Oh goodness – that looks MIGHTY FINE indeed!!! Quick oats, up to 3:1 for flour, will replace white flour if you don’t need to be picky about consistency & don’t want to go whole wheat – if you need to let it sit & the oats will absorb lots of moisture & may change the outcome. Add a little vanilla & it almost fakes the feeling of sweetness, adds a replacement for sugar’s flavor, lets you cut down on the sugar. Have done this w/success to re-think sugar cookies – it helps that I love oatmeal. The coffee cake looks delicious!